waterfall for picnic in the company of family. 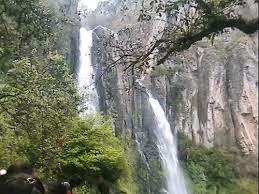 It can be downloaded at the bottom of the waterfall by stairs located within beautiful vegetation of the region. Funny thing, when I was running the hydroelectric plant, there were 365 steps to reach the top of the waterfall to the facility where the turbines were located; said steps were built for a year, a step every day of the year. Just 180 km. Of the City of Mexico, these wonderful sulphurous thermal waters (50 ° C) which is renowned for Internancional Chignahuapan level are located. Location Nestled in the Sierra Norte de Puebla, a semifreddo climate and an average annual temperature of 14 ° C. During your visit you can enjoy spectacular canyons, pure mountain air contact and harmony with nature. We have 70 comfortable rooms, an excellent restaurant where you can taste delicious traditional Mexican food and outdoor pools or indoors, with a constant flow of thermal water and the ideal place to enjoy the most of your stay in this beautiful place temperature. We have room with capacity for 100 people, a game room with big screen TV, outdoor walks and guided tourist places like the Basilica tours, lagoon Chignahuapan, Quetzalapan Waterfall, etc.